I finally took the time to read The Quilter's Apprentice. My friend Judy recommended it years ago and I just didn't want to read it. I have a few reasons for not wanting to read it. The first is that Judy is really into genealogy and she is passionate about books that reference history. I, on the other hand, have no real interest in my family's roots. I prefer to look toward the future than review the past. I guess I am just not that curious. And this book links some real history within the quiltmakers' stories. Another reason for not wanting to read this book is that I knew Jennifer Chiaverini's novels were in a series. If I end up liking the book I didn't want to get hooked on more novels. I have an endless list of books I want to read and more would just stress me out. I know how silly that all sounds so I took the plunge and read the book. Of course, Judy was right. It was worth reading. More for the historical links than the quiltmakers' stories. That was a little on the cheesey side. 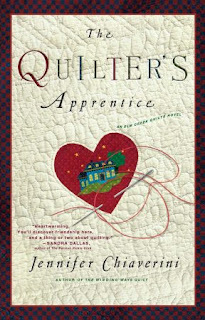 I did enjoy some of the quilt making references and it was an easy summer read. So I am hooked. I'm already waiting for the second book in the series to be ready for me to pick up at my local library.